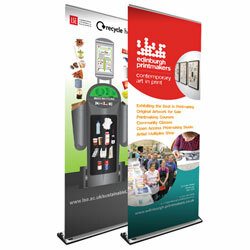 Our banners are printed full-colour one side to a heavyweight PVC antirip material, hemmed and eyeletted. They are also fire retardant and comply fully to health & safety and fire regulations. The sizes shown are examples; we offer many other sizes and can provide pole fittings or discounts on multiple orders – simply call us for a price.